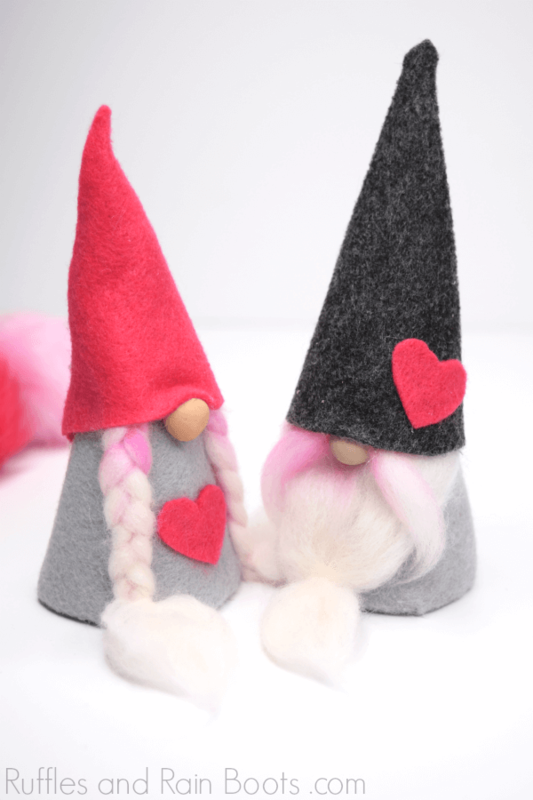 These Valentine felt gnomes are a quick craft that will add whimsy and fun to any Valentine’s Day. Grab some basic craft supplies and let’s get started! It’s almost that time of year: pinks and reds take over the blues and grays of the New Year. Hearts appear EVERYWHERE and diets are foiled by easy access to scores of candy. 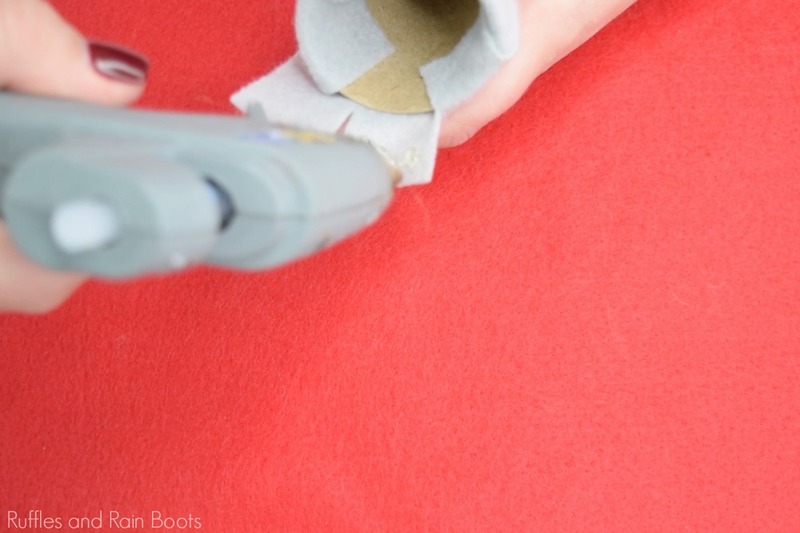 These felt gnomes are a simple DIY gnome for any age, however, I recommend younger kids (and the accident-prone adults like myself) use a low-temp glue gun. 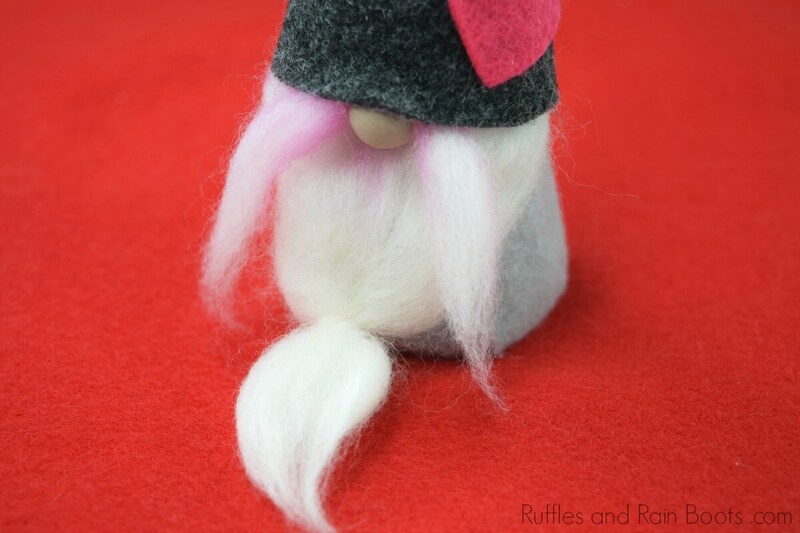 Below, you’ll find the step-by-step tutorial for felt gnomes perfect for Valentine’s Day. But before we get started, let’s talk through some tips first. 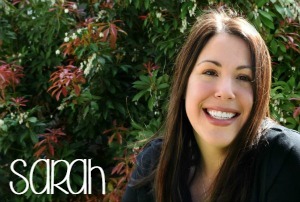 yarn – be sure you’re choosing a thick yarn you can brush out if you want the same look. Any pre-made cone will work, however, I recommend paper maché cones like these. The material is better for the environment than other options and they’re hollow. This makes them perfect for any gnome craft you’d like to make like ornaments, toppers, or decor pieces. I color the wool in this tutorial. If you have any questions after watching the video, just let me know in the comments below. Practice on a scrap piece of wool or fur. I didn’t have long to craft this adorable gnome set, so I didn’t stop to take still images. 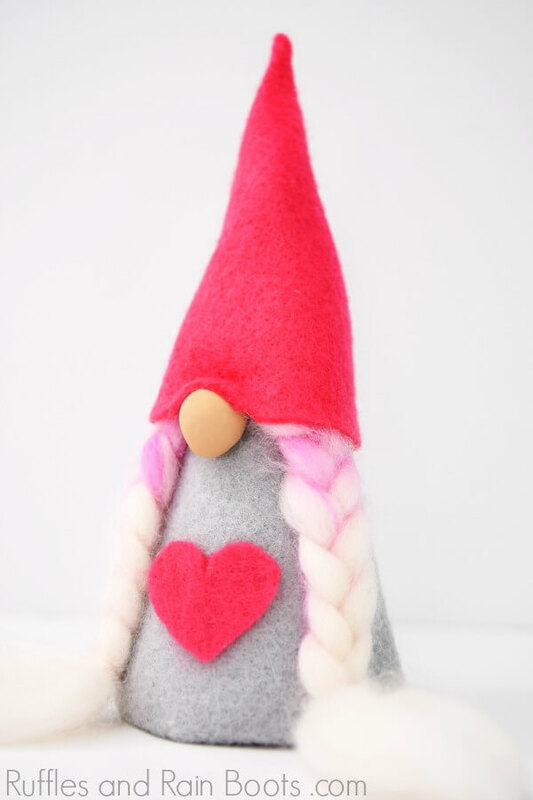 Below is the video (the Valentine felt gnome video tutorial is here on YouTube in case you have a playlist). Scroll down for the written instructions. I’ve received quite a few requests by readers to make my tutorials printable. And now, you can print off this craft! I’m updating all of the previous tutorials, so if there’s one you need, just let me know in the comments. 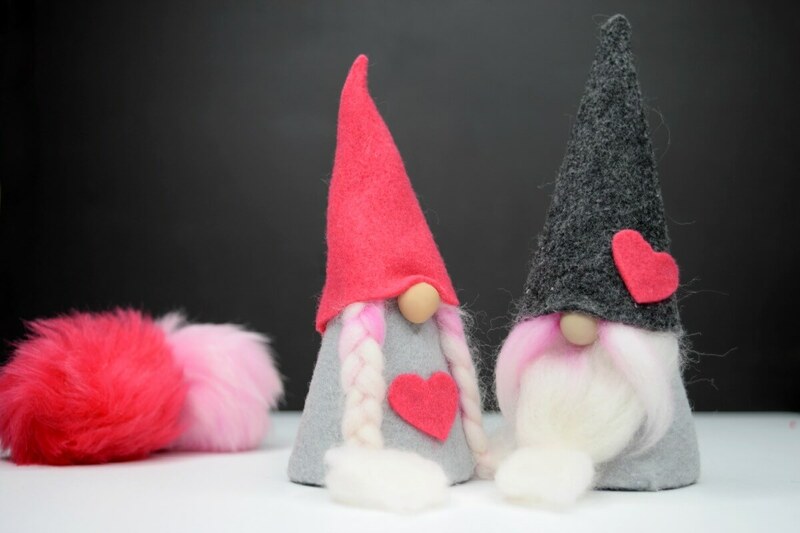 These adorable Valentine felt gnomes are a quick craft for the sweetest holiday. 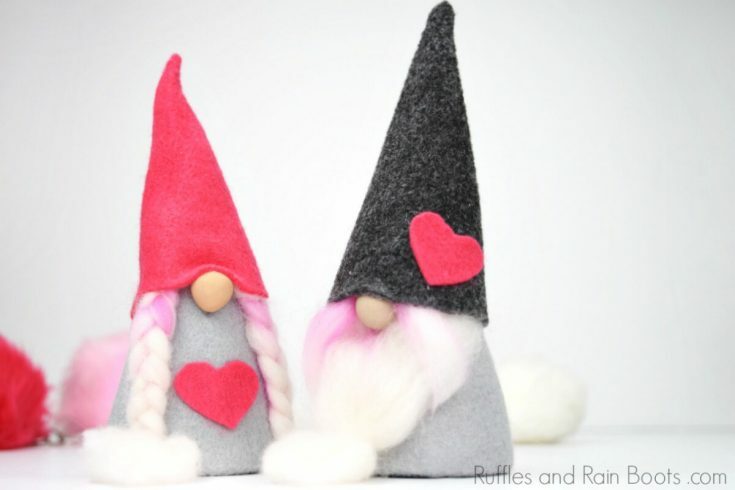 Grab some basic craft supplies and let's get started with these fun DIY gnomes. Measure the height of your cone (you can make any size) and cut out a triangle shape which fits around the entire paper cone (with a small overlap). 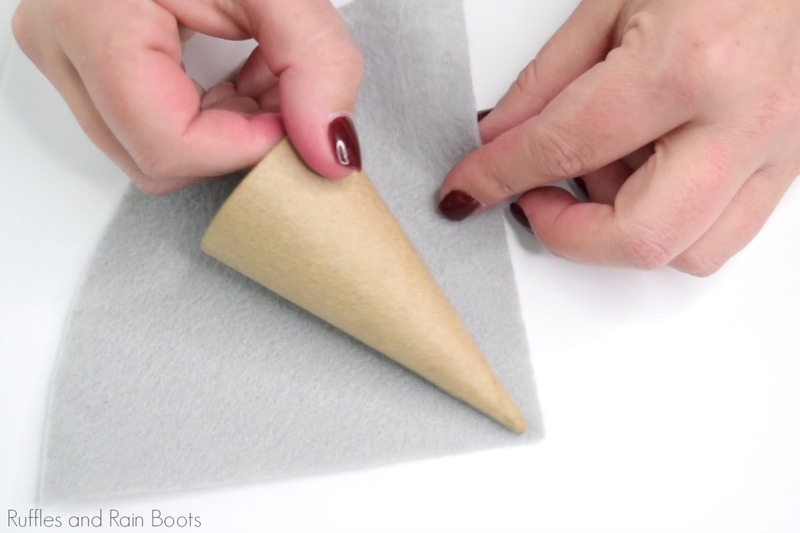 Hot glue the felt to the cone to cover. Cut the overlap section into small pieces and hot glue under the bottom of the cone. Measure how tall you'd like your hat to be and where you would like it to fall on the "face" of the cone. Cut it out and secure the cone hat with glue but do not attach it to the cone. Create your braids or beard and affix them to the cone, allowing still for a nose to be slightly pushed up under the hat. Glue on the nose after positioning the hat (but do not glue on until the nose is in position). Cut and attach any extra pieces and glue on the gnome hats. Gnome Ornaments – This one is very popular because it’s cute and quick! Cute Gnome Mason Jars – Got a gift to give? Change these up to Spring colors and make a garden-in-a-jar gift. Paper Plate Peek-A-Boo Gnome Craft for Kids – Little ones love gnomes, too. Psst: want more gnomes? 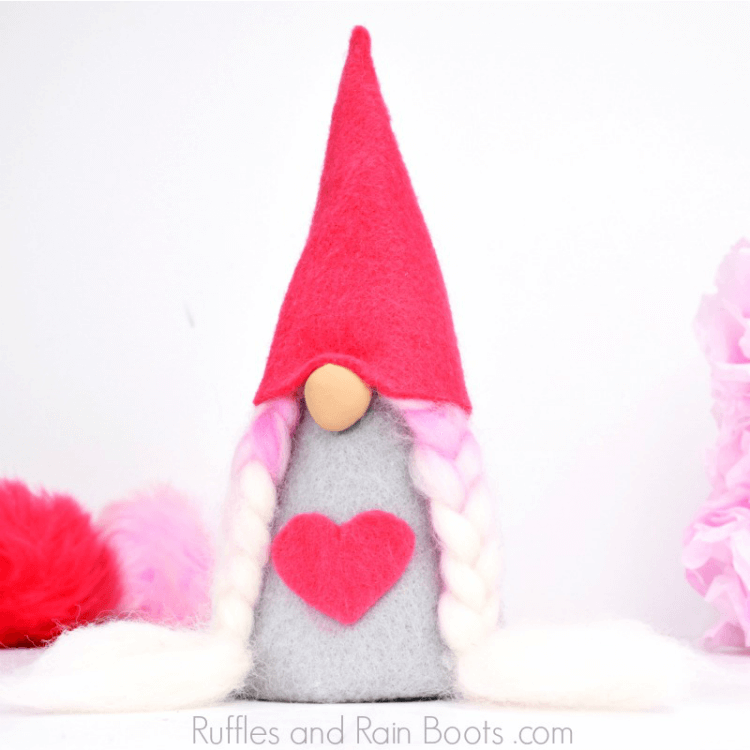 Check out all the gnome crafts on Ruffles and Rain Boots. I love all your gnomes, but these 2 are SOOOOO cute!